An excerpt from my review of We Kiss Them With Rain by South African writer Futhi Ntshingila, which can be read in its entirety over at Necessary Fiction. It might be the mood I’m in, but I’m finding subtle allusions to the Victorian-era in quite a few of the books I’ve been reading. Frankenstein In Baghdad is the most blatant call-out, but there’s also The Governesses by Anne Serre, Black Sugar by Miguel Bonnefroy… and, of course, this novel. The writing in these books feels more-than-a-little old-fashioned, with a hint of a moral/life-lesson at the end. Of course this might all be entirely in my head, but it’s definitely something I’m going to be thinking about as I look back on 2018. We Kiss Them With Rain is a social novel, more in line with the works of twentieth century writers like Upton Sinclair, John Steinbeck and Richard Wright,* than crusaders of the modern era. Like those earlier works, it is written with a dual purpose – to both entertain and inform – and relies on a series of somewhat far-fetched coincidences to resolve major plot points. The tone can be, at times, a bit earnest, but that earnestness is in service to highlighting institutional poverty, social inequality, victimization, and sexual assault. The virus is a palpable presence (the text is seeded with acronyms – HIV, AIDS and ARVs) and exists in the same room as the characters, like furniture. For Mvelo, who watches both Zola and Sipho die of AIDS, it is an obsession. It was that day, when her mother’s disability grant was discontinued, that Mvelo stopped thinking any further than the day ahead. At fourteen, the girl who loved singing and laughing stopped seeing color in the world. It became dull and grey to her. She had to think like an adult to keep her mother alive. She was in a very dark place. One day she woke up and decided that school was not for her. What was the point? Once they discovered that her mother couldn’t pay, they would have to chuck her out anyway. This is a charming book. Ntshingila’s writes simple prose, keeping comfortably within a young adult reading level. Her characters are awkwardly written, — as in one scene where Mvelo’s friend and neighbor attempts to read a Dylan Thomas poem over Zola’s grave and what is meant to be a poignant tribute becomes a belabored, if sincere, performance. What initially appears to be a flaw is ultimately a strength. The awkwardness covers the project with an unexpected blanket of authenticity. We Kiss Them With Rain is narrated in the third person, but this lack of polish on the final text makes it easy to imagine fictional Mvelo being the book’s actual/model author, writing her own story as if it were someone else’s. Little life lessons are sprinkled throughout, balancing the instructional (characters are constantly visiting clinics to be tested for HIV) with an aspirational happy ending. The final chapters are downright Dickensian, with an ending which encourages Ntshingila’s readers in their childlike hope that these characters – specifically Mvelo, one of the many orphans left alone in the wake of a terrible disease – will find happiness if only they follow the correct path. Not because everything is guaranteed to work out, but because she is given the gift of a future. *Dickens was left off this list, because I didn’t want too long a string of names. But I do call him out later in the review. His fingerprints are all over this particular book. Specifically, his way of weaving social issues into his plots without allowing them to take over or keep the story from being entertaining. Books can develop personalities separate from the characters and author. This is not true for every book – I’m not endorsing some new form of literary theory based on the psychoanalysis of literature. But sometimes it does happen. For example – Blood Meridian, by Cormac McCarthy is definitely a sociopath. Mundane day-to-day existence and violence are so enmeshed that they easily transition in and out of each other without missing a beat. It has no morality. The sentences contain no boundaries separating the characters’ speech from the action. It begins and moves in a single, linear path to its end. It is written in swarms of words and sentences which decimate whatever lay in their paths like locusts. It sees and relates to the world only in terms of itself. You see, books with personalities are so themselves that we don’t need to wait for some reviewer or critic to tell us what they are about, what we should think about them, or worst of all – what they mean. It’s all as plain as day. Pride and Prejudice by Jane Austen is another. If you’ve read it, you’ve probably reread it. And possibly re-reread it again. It’s that girl who everyone wants to talk to at parties, or the favorite aunt we look forward to seeing at the family reunions. The one who knows all the family gossip. Yet, it’s so happy, so witty, and so much fun to be around. It has the entertaining ability to tell a good story, to point out everyone’s character flaws. And all done in such a good-natured way that no one is offended. 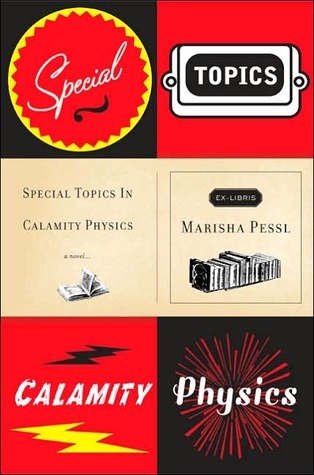 This leads me to the point: Special Topics in Calamity Physics is a magician, an illusionist, a master of misdirection. It’s the rarest of all books – with a plot that midway through changes trajectories and becomes a different book from the one you thought you were reading a few pages ago. You zig, the story has zagged. But Marisha Pessl does it in so clever, so subtle a way that there’s no discordant note jarring you out of the story. You don’t sit there trying to figure out what the hell just happened or locate the jump in continuity. Instead you thumb back through the pages wondering how you could have been so dense as to have missed the connections. It all seems so obvious when you reach the last chapter… like the scene when the detective looks around the office at the end of “The Usual Suspects”. You’ve been so confident in the preconceptions you established all the way back when you read the back cover in the bookshop, that you never saw the twist coming. And THAT is brilliant storytelling. Don’t let anyone try to tell you otherwise. So how do I give you a plot summary, without giving away the plot? Obviously, it is a mystery (the book, not the question). It is also a coming of age story. It’s a first novel, and like many first novels it’s written in the first person. It’s a damn good read. This is the story of Blue van Meer, told by Blue van Meer, one half of what must be the most engaging father/ daughter team since Atticus & Scout. Dad always said a person must have a magnificent reason for writing out his or her Life Story and expecting anyone to read it. Dad is an award-winning, famous in his field, poli-sci professor. He and Blue have been traveling in a Volvo station wagon between backwater colleges for the last 10 years, since Blue’s mother died in a car accident. The total number of schools Blue had attended in that time I think was 24 (don’t quote me). She was the perpetual new girl, except that “that glittery title was always stolen from me within minutes of my arrival by someone fuller lipped and louder than I”. At the beginning of this story her father surprises her with the announcement that her entire senior year of high school (prior to attending Harvard) will be spent in one place: St. Gallway Academy. During her first week at St. Gallway Blue is begrudgingly befriended by the Bluebloods. The name pretty much speaks for itself: they are rich, beautiful and privileged. The Bluebloods – Jade, Charlie, Milton, Leulah and Nigel, – are in the thrall of Hannah Schneider. She is their film teacher, their friend, and their muse. It is to please her that they allow Blue into their inner circle. In the normal course of events, if they noticed her at all, Blue would be their prey. Early on, (i.e. – when you pick up the book, turn it over, and read the blurb) you learn that the climax of this story is the death of Hannah Schneider. The plot hinges on questions: Who is Hannah Schneider? Why her connection to the Bluebloods? What is her interest in Blue? Intertwined with these questions are the stories of the Bluebloods, Blue’s parents, the June bugs and a strangely normal boy named Zach. But mostly this is Blue’s story. A story she has unknowingly been at the center of her entire life. Quick Note on the format of the book, which I loved. Pessl has written the book like a curriculum – divided up into 3 parts, and then into Chapters. Each chapter title is the title of a book which is on the Required Reading list. Citations sprout throughout. In one chapter we even get footnotes. Special Topics in Calamity Physics could be Blue’s entrance application essay for Harvard. I showed this cover to a co-worker. Her reaction? "That's appalling! Poor Emily Dickinson!" The Secret Life of Emily Dickinson: A Novel is Jerome Charyn’s love letter to the poet. He admits as much in his author’s note. His attachment is not unusual. Others have attempted first person, fictionalized accounts of Dickinson’s life. What is astonishing is the skill with which he assumes the voice of the poet, completely capturing the ferocity of her attachments and the violence in her language. He picks out (and sometimes overuses) all the idiosyncratic phrasing and touch-words that we associate with her work. There is no question that this is the Emily whose letters and poems have been handed down to us. She is Austin Dickinson’s “wild sister”, who would never be confused with the meek, timid spinster of legend. Charyn has done his research thoroughly, presenting a vibrant, red-head who burns and crackles off every page. But having perfected the voice, Charyn seems to have trouble deciding what to do with it. The novel has no real trajectory. Told chronologically, it opens at Mt. Holyoke where Emily becomes infatuated with the school’s blond handyman. It is the first of many infatuations that make up the meat of the narrative. (At one point Sister Sue accuses Emily of having “a craziness for men”). And while the book also has a string of lovely, dreamlike images – Emily becoming a pickpocket’s ‘mouse’, a pair of yellow gloves, a circus elephant in mourning and Little Sister Lavinia dancing around the room after discovering the handmade booklets of Emily’s poetry – they are poorly woven together. 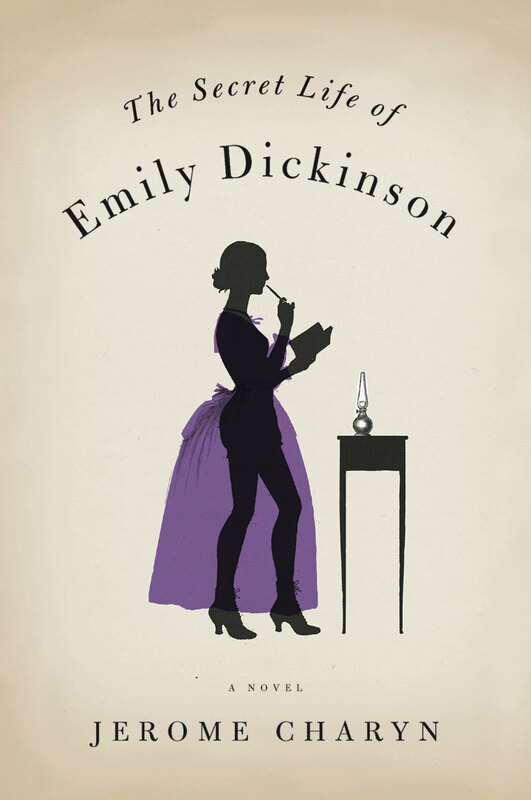 Perhaps a more accurate title would have been The Secret Inner Life of Emily Dickinson… which is where the real action of the story takes place. All indications are that Dickinson had a rich and complicated mental life. I think it is a shame that Charyn made the choice of focusing on romantic fantasy rather than the real poetry. Stream of conscious is tricky and can quickly get away from a writer if structure isn’t imposed. Charyn must have realized this, because at intervals (roughly coordinating with chapter headings) he inserts third person narration to help establish what point we have reached in Emily’s life. And the book spans her entire life from that first paragraph at Mt. Holyoke to her death. Many of the characters are complete fabrications, which didn’t bother me at all. But if I had a chance to question the author I would ask about where he drew his fiction/non-fiction line in the sand. There were several places where it felt like a fictional over-arcing plot was being developed, only to be dropped as another beau exited (if only temporarily) Emily’s life. Early chapters had all the makings of a good mystery. Obviously, Charyn did not intend to write a mystery. So what are we left with? The Secret Life of Emily Dickinson went on a little long for my tastes. (No lie – Once Dickinson reached her late 40’s I refreshed each page hoping she’d be dead on the next). I would have preferred more of a plot. But the writing in this novel is glorious. Charyn takes us into Emily Dickinson’s head – a woman whose poetry is still considered revolutionary and cutting-edge 125+ years after her death. That is a tremendous accomplishment. And for some readers it will be enough. (And in case you disagree, you can follow the blog tour from here and read what some other bloggers think). Publisher: W.W. Norton & Company, New York (2010). Milk & Cookies. Chocolate & Peanut Butter. Zombies & Bloggers. The best things in life come in pairs. Mira Grant’s Newsflash Trilogy takes her readers into a world where the people no longer trust the conventional news media, we’ve cured cancer and the common cold… and side effects include lots of moaning and attempting to eat your neighbors after you die. Georgia (George) & Shaun Mason are brother & sister bloggers. The year is 2039 and they’ve just hit the big time. One of the lead presidential candidates has made an unprecedented decision – to include bloggers as part of his media team. Senator Peter Ryman is the first person to run for president who was under the age of 18 when “The Rising” occurred, and that means he remembers the suffering that occurred when the traditional news outlets lied and only the bloggers were left to tell the truth. He’s chosen the Mason siblings – and their friend Buffy – to report on his campaign. FEED introduces the reader to a new blogger world order. George is a Newsie – she reports straight, un-doctored truth and her reputation is impeccable. Shaun is an Irwin – thrill seekers (think Steve “the Crocodile Hunter” Irwin and the guys from Jackass) who provide valuable survival tips spiked with a heavy dose of suspense. Buffy, a “Fictional” – author and poet, as well as a techie extraordinaire – rounds out the trio. Mira Grant is a pen name of Seanan McGuire. If you read BookSexy you know I’m a huge fan of her October Daye novels. This new series has all the same strengths and weaknesses. I’m an acolyte of the Robin McKinley school of world building – throw the reader into the deep end and let them learn to swim. McGuire’s…um, I mean Grant’s… technique is the exact opposite. She explains everything and she explains it more than once. It annoys the hell out of me – Because, really, who is George (the narrator for most of the book) explaining all this stuff to? In the October Daye books the explanations can be justified because Toby describes a world that theoretically exists parallel to our own but is hidden. But Georgia would logically assume that anyone she’s talking to is a contemporary and would already have a handle on the zombie situation. This inexplicable need to dumb down the narrative keeps a really good genre novel from becoming a great one. But, even with its flaws, FEED is still fantastic – better than most zombie movies. The characters are people readers believe in and care about. You can’t help yourself. And, I’m warning you now, when McGuire’s holding the pen anything can happen and no one is safe. The story twists, turns and ties you up in emotional knots. I laughed. I cried. (Seriously, I really did cry). O.K., it’s not going to win a National Book Award… but who cares? If you want to deal with zombies, stay away from the teeth, don’t let them scratch you, keep your hair short, and don’t wear loose clothes. It’s that simple. Making it more complicated would be boring, and who wants that? We have what basically amounts to walking corpses, dude. Nada is a strange novel. I’m not completely sure what to make of it. Spanish literature can often have a labyrinthine quality to it, which isn’t surprising when you remember that Spain gave us Gaudi, Dali & Picasso. It’s a theme picked up by contemporary Spanish authors like Zafon; in films like Pan’s Labyrinth; and in Nada, Carmen Laforet’s award winning 1944 novel – translated by Edith Grossman – where the heroine is continuously wandering the hallways, streets and alleyways of Barcelona. The plot wanders as well. Repeatedly (and abruptly) leading the reader into dead ends. Andrea, the narrator and heroine of the story, is an orphan. She is plain and sullen. To her, Barcelona is a glamorous city and she’s come there for all the cliché reasons that young people leave their homes in the country to travel to big cities. On her first morning she tells us, “I was in Barcelona. I had heaped too many dreams onto this concrete fact for that first sound of the city not to seem a miracle”. Her plan is to attend university and live with her dead mother’s family. Illusions are quickly brushed aside, though, and the realities of her new life exposed – squalor, petty melodrama and hunger. Nada is set after the Spanish Civil War in Franco’s Spain. A chasm divides the rich from the poor and Andrea’s family falls in amongst the latter. They live in filth and are slowly starving to death. But the reader get’s the feeling that their poverty is of their own making. The inhabitants of the small apartment on the Calle de Aribau are actors in a macabre, co-dependent drama. Sadistic and manipulative Uncle Roman is the planet around which the others orbit like an astroid belt, colliding and crashing at his amusement. There is crazed Uncle Juan, Gloria his battered wife, and their baby (always on the verge of dying); pious and hypocritical Aunt Augustias; the grotesque maid, Antonia, slavishly devoted to Roman; Andrea’s vague, sweet grandmother. Nada strives to be a Gothic tale. Unfortunately, it never quite achieves the success of its English, 19th Century, counterparts. It’s not without some charm, though. Which I suppose is what I mean by strangeness – the plot and the writing feels truncated. Edith Grossman may or may not be to blame. This new translation has garnered a lot of praise, but the sentences are too self-contained for my tastes and do not transition smoothly one into the other. I’d like to believe that is what Laforet intended when she wrote them, but there are other, lyrically descriptive passages in this novel that hold the promise of better writing. “The night seemed splendid, with its breath as warm and pink as blood in a vein opened gently over the street”. At the same time, this choppiness of the rhythm could be defended by a fan of the book. It adds to the disjointed atmosphere of the novel. During the period in which the events she describes take place, Andrea is starving to death. The story she tells us is limited to what she has been told, what she observes and what she imagines. What she knows, we know – no more and no less. All relayed in a narrative voice that is both feverish and rambling. (There is even a portion in which she admits she was slightly delirious and half asleep – hearing the voices of Gloria and her grandmother as she drifts in and out of consciousness). Maybe the tone of the writing sometimes feels dated, but the descriptions are saturated with the colors of the 1930’s and 40’s. Andrea’s life is messy, so why shouldn’t the prose to reflect that? Did I like Nada? Yes and no, for all the reasons I listed above. Would I read another book by Carmen Laforet? Definitely. Would I recommend Nada to someone else? Maybe. If a friend wanted to borrow it I wouldn’t try to dissuade them or redirect them to another book. But I wouldn’t worry about them returning it either.